Over the weekend I couldn’t help but think about Jack, a young guy I met last August when I was at Starting Point in Stockport to talk about the role of digital technology in democracy, during a roundtable discussion for the Digital Democracy Commission. I was reminded of Jack because it’s now only a month until the General Election, and there are only 14 days left to register to vote. When I first met Jack, at Starting Point – that’s part of Taylor’s Fish and Chip Shop – he’d never had anything to do with politics. He had no idea what a polling station was and definitely had no interest in voting but by the end of our chat something had changed. He now knew that politics is something that affects everyone, not just “the men in suits in Westminster”, and that by voting everyone has a say in how the country is run. He knew he had a role in the politics of the UK, and he had a choice in who should represent him. Not only was he showing an interest, but he was angry at the fact that no-one, including his school, had made the effort to provide him with even the basic information about what democracy is, how the UK political system worked and his role in it. I hope the discussion I had with Jack did a little to inspire him to vote in a month’s time – and I certainly hope he has at least registered to vote. If Jack does decide to vote, I wonder if he’s got enough information to make his decision as I know it can be hard navigating the rhetoric and the 24 hours news cycle in order to decide who is the right party/representative for you. With this in mind, the Tinder Foundation team have put together a Digital Democracy Toolkit – some of the brilliant resources from around the web on Community How To so that everyone has the chance to make that decision. Whether you’re unsure who your current local MP is (take a look at Find Your MP), or you want to know what’s actually going on in parliament (TheyWorkForYou will help) there’s so much on there. And of course, there’s a link to registering to vote on there too! If you think there are any tools missing then do just register on the site and add them yourself. 8th May (or maybe a little after that) we find out who is our next Government. I’m a passionate advocate of democracy, and I would like everyone to feel informed and included enough to exercise the right to vote on the 7th May and to shape the future we want for our country. I hope you find the new toolkit useful as you make your final decisions on where to place your vote in one month’s time. 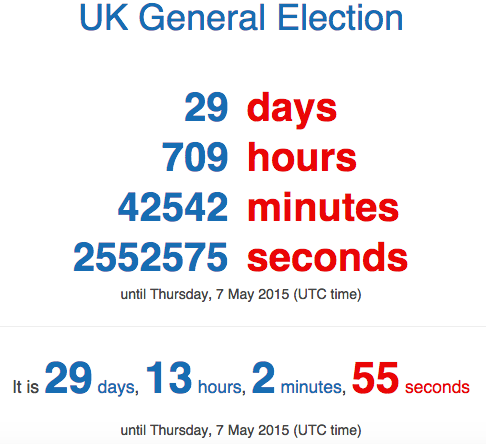 And here’s a tool to make your own countdown clock to May 7th and election day.